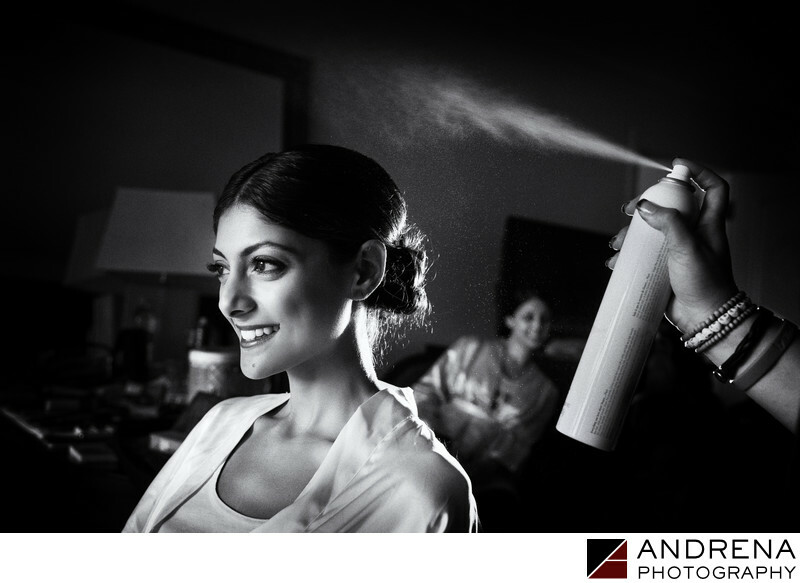 When a photographer encounters a foggy day, they may not have the same quality of light in the bride's getting ready room, as was the case at this Indian wedding at the St. Regis in Monarch Beach. Understanding lighting can help a photographer work around challenges and can enhance the final photograph. This image of two sisters was illuminated by off-camera lighting, with one light in the front and one in the back, positioned to highlight the hairspray as well as the back of the bride's head. Her sister can be seen peeking into the image, which is especially sweet to me, as I also photographed her wedding. It is always an honor when I am chosen to photograph two weddings in one family. This wedding ran on Maharani Weddings. Indian wedding photographed at the St. Regis in Monarch Beach, California.